This dramatic song featured on the official Footloose soundtrack album. On its original release in 1984, the song stalled at #96, but the 1985 re-release just missed the top-spot in the UK charts, peaking at #2. Another re-release in 1991 reached #69. The 1985 re-release entered the chart at No.34 on August 28th 1985, making it the third highest new entry that week, behind Madness at No.30 with "Yesterday's Men" and Thompson Twins at No.22 with Don't Mess With Dr. Dream. 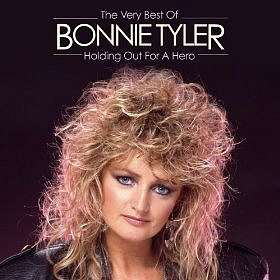 By 8th Sept, "Holding Out for a Hero" had reached No.2, where it remained for three weeks, being held off the No.1 position by David Bowie and Mick Jagger's "Dancing in the Street". The B-side (Track 2) on the 7" and 1991 CD re-issue was "Faster Than the Speed of Night" (4:40), the title track from the album which was released as a single in 1983, reaching No.43 in the UK. 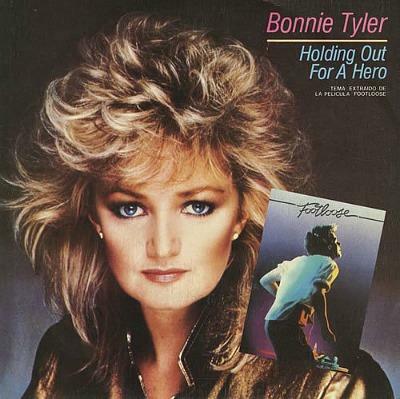 The 12 inch single included this as the third track, alongside the Extended Remix and Instrumental version of "Holding Out for a Hero". The song was written by Jim Steinman and Dean Pitchford, and it will come as no surprise to learn that Steinman composed many hits for Meat Loaf, given the similar style of the song. The video was directed by Doug Dowdle and produced by Jeffrey Abelson. It starts with Tyler inside a burning house, and we also see female backing singers wearing anglelic white dresses. Tyler runs from the house as she sings "Where have all the good men gone and where are all the gods?" Hmm, where have all the dramatic songs gone I ask myself? We need more drama and powerful productions in today's music! There is also a shot of Tyler wearing a white dress while stood on the edge of the Grand Canyon. Outside the house, Tyler kneels on the floor as she is surrounded by three cowboys with whips who are dressed in black. Then a cowboy dressed in white and riding a white horse chases away the three bad cowboys. At the end of the video, while Tyler is still on her knees, the good cowboy stands over her as she looks up at him. There's no denying that the video is extremely cheesy and anti-feminist, but I still much prefer this to the majority of modern day pop videos which are often full of scantily-clad ladies and suggestive, done to death dance routines. The idea that a woman needs a man to protect her may be outdated, but I reckon there's still plenty of room for some good, old-fashioned chivalry. 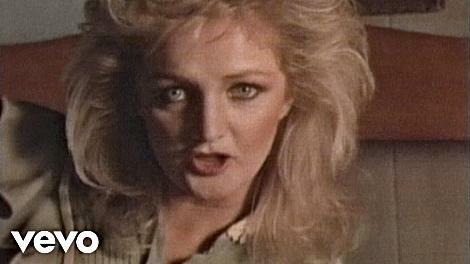 Bonnie Tyler released seven Top 40 hit singles in the UK between 1976 and 1984 - numerous other singles failed to break the British Top 40 - although she continued to have hits in other countries until 2004. The welsh singer's real name is actually Gaynor Hopkins, and has a distinctive gravelly voice - this was the result of an operation to remove nodules from her voice box in the mid 70s. Tyler's other big 80s hits were Total Eclipse Of The Heart (#1 in 1983) and a A Rockin' Good Way (#5 1984) which was a duet with Shakin' Stevens.